are only eligible for applying this UIIC Assistant jobs. Online applications for this UIIC Assistant Recruitment Notification will starts from 14-08-2017 and will closed on 28-08-2017. Selection for these UIIC Assistant vacancies will be held through Preliminary Exam and Mains exam. Online applications form this UIIC Assistant Jobs recruitment will be accepted through www.uiic.co.in website. 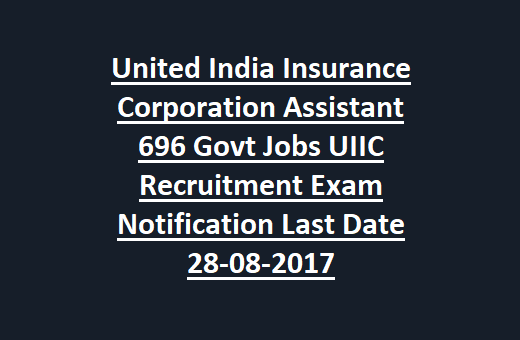 If you are interested work with United India Insurance then don’t waste your be apply online on or before the closing date and start preparation for UIIC Assistant Preliminary Examination. For more details regarding this UIIC Assistant jobs of United India Insurance Recruitment Exam syllabus, pattern, age limits, qualifications, salary and other details are given below. Download UIIC Assistant Prelims Exam Result here..
Any Bachelors degree from recognized university and knowledge of computers is required for this UIIC assistant jobs. Age limits as on 30-06-2017 is 18-28 years. For SC/ST/BC candidates age limits are as per the government norms. Selection for this UIIC Assistant Jobs will be through Prelims and Mains Examinations only. For this UIIC Assistant jobs applications will be accepted through online mode only through the United India Insurance Corporation website of www.uiic.co.in. Last date for submission of application online for this UIIC Assistant Jobs is 28-08-2017. 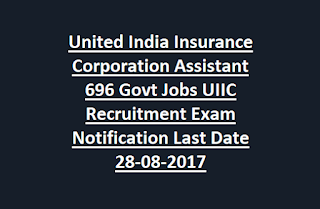 Click hereto apply online for the UNITED INDIA INSURANCE Company Assistant Vacancies Recruitment 2017.